Hamburg, February 8 2012 � Olympus is taking the forty-year pedigree of the OM series into the next generation with the launch of the OM-D, featuring the world�s first*1 5-axis image stabilisation (IS) system to eliminate blur in stills and movies. The user can appreciate the blur reduction effect via the fast electronic viewfinder during active shooting, while simultaneously benefiting from the fastest*2 auto-focus of any interchangeable lens camera (including D-SLR), in a further refinement of the world-beating FAST AF (Frequency Acceleration Sensor Technology) also found on the popular PEN series models. The camera�s innovative new 16.1 megapixel high-resolution Live MOS Sensor works in tandem with the powerful TruePic VI image processing engine to achieve outstandingly refined image quality and high sensitivity. The 1.44 million dot high-definition electronic viewfinder is all-round smarter, allowing the user to check manual adjustments to brightness and colour tones on-screen, and with a new interface for exceptionally easy viewing. This faster, sharper, smarter camera comes attractively packaged in a durable dust-/splashproof magnesium-alloy body that makes the OM-D a go-anywhere camera. New accessories such as the optional HDL-6 power battery holder grip, MMF-3 Four Thirds mount adapter and FL-600R electronic flash add to its adaptability, while two new lens options � the M.ZUIKO DIGITAL ED 75mm 1:1.8 and the M.ZUIKO DIGITAL ED 60mm 1:2.8 macro � are under development and will extend creative applications for the user. The OM-D (E-M5) comes in a silver or black body. The OM-D body is available from April 2012 for � 1099.00, or as a kit with the black M.ZUIKO DIGITAL ED 12-50mm 1:3.5-6.3 for � 1,299.00. Experienced camera users will appreciate the advances in camera speed on the OM-D, with the FAST (Frequency Acceleration Sensor Technology) AF system, a world-beater also featured on the PEN E-P3, driving the Live MOS Sensor at 120 fps. The speed of communications for controlling the lens action has been improved, while the MSC (Movie & Still Compatible) system has also been adopted for AF speed increase and noise reduction in the lens. In sequential shooting, the camera is capable of operating at an impressive 9 fps, and even with focus employed it can perform at a maximum speed of 4.2 fps *3. Users are also sure to appreciate the noticeable reduction in Live View return time after release. This has been achieved by using independent image-processing cores for the recorded images and Live View images, as found in the new TruePic VI engine, since the output to the rear-panel monitor or electronic viewfinder is no longer dependent on completing recording of the captured image. The new High-Speed Live MOS Sensor on the OM-D comes with 16.1 megapixels, and allied to the TruePic VI image processing engine it offers excellent noise reduction capability and still image shooting sensitivity as high as ISO25600. There�s more faithful reproduction of a wide brightness range, thanks to the expanded dynamic range. Fine Detail Processing technology, first seen on the E-5, eliminates moir� and pseudo-colours, while Real-Colour Technology is used to reproduce previously hard-to-render colours such as emerald green. The OM-D offers a new �Key Line� filter to enhance edge lines, allowing the picture to look more like an illustration; there are two variations, providing different-strength effects. Art Filter Bracketing enables the user to generate multiple pictures with different Art Filters from a single shot � all features designed to inspire the user to experiment and become more creative in their camera use. The 1.44 million dot high-definition integrated electronic viewfinder is a first on an Olympus interchangeable lens camera, and is sure to prove a strong selling point. It features a 100% field of view and max. 1.15x magnification, with an 18mm eye point. The optimised display time lag is a major benefit, particularly when shooting fast sports action, while the unique optical design means the image can be viewed clearly from the centre to the periphery with little or no vignetting. The camera�s eye sensor can switch between the rear-panel monitor and electronic viewfinder automatically � a small but significant enhancement to ease-of-use. Information, including shutter speed, is displayed at the bottom of the viewfinder � allowing the user to concentrate on the framing operation. The electronic viewfinder, unlike an optical viewfinder, also assists in image composition, by allowing the user to check the effects of various manual adjustments and Art Filters. Extended through-the-viewfinder operation is further facilitated via a new interface, EVF Creative Control, which enables separate adjustment of highlight and shadow brightness, monitored using the viewfinder image with a tone curve overlay. White balance, magnification and aspect ratio can similarly be adjusted without the eye moving away from the viewfinder. The previous mechanism compensated for camera shake by dealing with two kinds of rotary movement, yaw and pitch. However, camera shake is actually caused by five different kinds of motion, and the new IS mechanism now also corrects effectively for horizontal shift, vertical shift and rotary motion (rolling). Particularly when shooting at larger magnifications (macro shooting), the user will appreciate the value of being able to correct blur. The OM-D also comes equipped for shooting on the move, as multi-motion IS with wide frequency-band compatibility compensates for shake. The camera�s built-in IS has evolved into the MSC (Movie and Still Compatible) IS system, offering improved stabilisation of movie images. Users who like to perform their movie post-editing on a PC will particularly appreciate the Full-HD movie recording function which adopts the MOV format (MPEG-4 AVC/H.264). It allows a recording time of about 29 minutes. Traditional AVI (Motion JPEG) format is also available. Linear PCM audio is used for both recording modes. One-shot echo and multi-echo effects can now be added to movies, adding to the user�s creative options. Alongside the enhancements to facilitate operation while working through the viewfinder, the OM-D also features a 3.0-inch OLED rear-panel monitor that can be tilted by max. 80� upwards or max. 50� downwards, to assist when shooting from high and low angles. It uses a special layout of 610,000 dots and can display video data equivalent to VGA, while its capacitive-type touchscreen has a high response speed that enables intuitive operation with finger-tip focussing and shutter release. In a further development facilitating ease-of-use, the Live Bulb feature updates the Live View image on the rear-panel monitor at preset intervals during bulb shooting. It also allows the user to assess the final image during the exposure and to adjust the exposure time accordingly. The OM-D is a camera to rely on, even in demanding conditions. It makes extensive use of shields and has a tough dust-/splashproof construction. 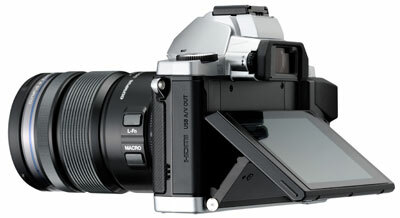 To facilitate use of interchangeable lenses, Olympus has developed the SSWF (Super-Sonic Wave Filter). Installed in front of the image sensor, it is activated as the camera is switched on to remove any dust attached to the image sensor by generating supersonic vibrations. The OM-D is compatible with all MFT Olympus lenses, which will be supplemented by two new lens options later this year: the M.ZUIKO DIGITAL ED 75mm 1:1.8 and the M.ZUIKO DIGITAL ED 60mm 1:2.8 macro. The 75mm lens is in a high-quality metal design and affords fast aperture settings for portraits and indoor sports shooting, while the dust- and splash proof 60mm lens features 1:1 macro and a closest shooting distance of just 0.19m. The OM-D (E-M5) body is available in black or silver from April 2012, for � 1099.00, or as a kit with the black M.ZUIKO DIGITAL ED 12-50mm 1:3.5-6.3 for � 1,299.00. HLD-6 power battery holder grip, in the same dust-/splashproof construction as the OM-D body. This innovative, adaptable two-part grip can be used either as a landscape grip, for easier camera handling, or (with the second part attached) as a portrait grip with an additional shutter release. The portrait grip accommodates a extra lithium-ion battery to supplement the one in the OM-D, thus extending battery life. Used together, the camera can record about 650 images (CIPA test standard). FL-600R electronic flash (GN 50 at ISO200 or GN 36 at ISO100), with improved recharge time and enhanced flexibility and operability for movie recording, and with a wireless control option. The flash is equipped with an LED that can be used to light movies and as a brighter AF auxiliary light. MMF-3 four thirds mount adapter. Designed for mounting a four thirds lens on a micro four thirds camera body, the MMF-3 features the same dust-/splashproof construction as the camera. It is ideally suited for use with similarly dust-/splashproof "Pro" and "Top Pro" series lenses. *1 As of February 2012. Among interchangeable lens cameras. *2 As of November 2011. Among interchangeable lens digital cameras on the market, and using Olympus�s in-house test conditions. *3 When fitted with the M.ZUIKO DIGITAL ED 12-50mm 1:3.5-6.3 EZ lens.